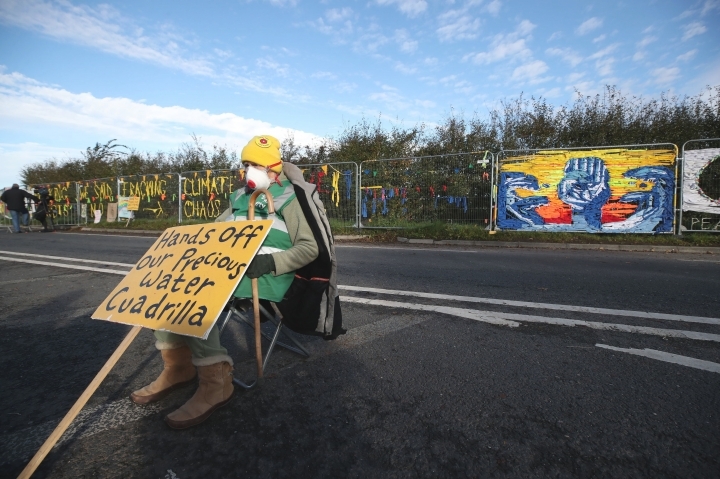 LONDON — Protesters have gathered near a shale gas exploration site in northwestern England, as fracking began in the U.K. for the first time since 2011. Hydraulic fracturing had been stalled in the country after two earthquakes in the same area led to legal challenges. Environmental campaigners failed last week in Britain's High Court to keep the work in Lancashire from proceeding. Energy firm Cuadrilla said in a statement Monday that it was "pleased to confirm that it has started hydraulic fracturing operations at our Preston New Road shale gas exploration site." The company plans to drill at two horizontal exploration wells for about three months. Demonstrators say they'll monitor the site around the clock. Protester Ginette Evans said Monday: "The fight's just really started."